The game Eyecatcher will challenge your mind and senses as you try to place your tiles. The Eyecatcher tiles may look simple, but they're designed around unique color sequences that will have you stumbling as you try to place them on the board. In this race against time you'll be fighting to get the most points by placing the most tiles. 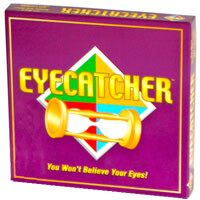 Eyecatcher is an intriguing party game that you'll want to play time and again with family and friends. Eyecatcher is difficult to master because each turn varies and brings a new challenge. Grab Eyecatcher to play at your next get-together. The goal of Eyecatcher is to have the most total points by the end of 5 rounds. Points are won by placing tiles correctly on the board. The Eyectacher game comes with the game board, Eyecatcher game tiles, sand timer, pyramid die, Eyecatcher score pad, pencil, and Eyecatcher game rules and instructions. Please keep in mind that the official Eyecatcher party rules and instructions could be different depending on the game version you have. The rules below are some of the exact directions on how to play Eyecatcher. Share with us your comments, funny stories, tips, advice, strategies, creative ways to play, questions about how to play, problems with the rules or anything you want about Eyecatcher. All submissions will be reviewed within 24 hours. Click here to add your Eyecatcher comments.